With the short stories by Shi Zhecun (2), published a few months ago, in a translation by Marie Laureillard and Gilles Cabrero, you can discover an author somewhat forgotten and whom we knew only with two short stories translated into the excellent book “The Shanghai Foxtrot” (3) by Isabelle Rabut and Angel Pino. 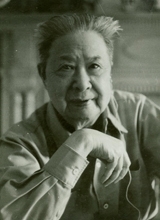 Shi Zhecun (1905-2003) was born in Suzhou, but he spent his youth in Songjiang in Zhejiang with his father, a teacher. He is interested in poetry and very young started to publish. He studied English in Shanghai and a little French at Aurore university, founded by French Jesuits in 1903 and where he met several writers with whom he created the journal Xiandai. Teacher, translator, editor of magazines; his short stories beginning to be known but it is Xiandai the journal, which he managed from May 1932 to May 1935, which made him famous. This journal Xiandai, “Les contemporains” is a monthly literary journal printing 5000 copies and which published a hundred translations from foreign literature (primarily U.S. and Japanese). The journal informed on the new techniques of contemporary literature and therefore had a definite influence on Chinese literature as explained by Zhang Yinde (4). Several writers in this group are pretty amazing characters: Liu Na’ou, Taiwanese with a Japanese mother, educated in Japan and then a student at Aurore; he was assassinated at 39 years old probably because of his ties with the pro Japanese government of Wang Jingwei, established in Nanjing. We can read one of his texts in the collection published by Isabelle Rabut and Angel Pino (3). The same goes for Mu Shiying (1912-1940), protected by Shi Zhecun and murdered for the same reasons that his friend Liu Na’ou. One can also read his short story in the excellent “Shanghai” (5), published by Nicolas Idier. It is Shen Congwen, a Hunan Tujia, living in Beijing who criticizes greed, dilettantism of Shanghai writers who flatter the lower instincts of their readers. Finally, Lu Xun sends away the two sides by highlighting the traditional antagonism between merchants and officials but also their common rejection of political involvement. This literature from Shanghai is an urban literature by its subjects, its mentality, its style but as said by Isabelle Rabut (4): “The literature known as” Mandarin Ducks and Butterflies “has regained the respect of literary historians … Short prose essays (xiaopin) on various aspects of daily life … enjoy also such a revision in judgment “(p.38). Several American professors (Patrick Hanan, William A. Lyell, Leo Ou-Fan Lee) have also revived interest in the literature of Shanghai showing the variety of genres and strata from the most popular to the modernist and elitist. Nine collections of short stories, almost 70, are published between 1923 and 1937. The author introduces a number of literary techniques, but without breaking and he remains committed to the tradition and his style and the composition of his short stories are particularly elegant. Two interesting texts are also published: an essay written after the death of Shen Congwen (1988) and a text deliberately very “sophisticated”, “The Taste of Rain” (1937), brilliant but a bit disappointing. (1) Feng Zikai, ” Couleur de nuages”, text translation and introduction by Marie Laureillard. Bleu de Chine Gallimard, 2010, 205 pages, 22 euros. (2) Zhecun Shi, ” Le gout de la pluie”, 14 short stories translated by Marie Laureillard and Gilles Cabrero. Bleu de Chine Gallimard 2011, 340 pages, 24.50 euros. (3) ” Le Fox-trot de Shanghai “, short stories by Shanghainese writers and Beijing storytellers from the thirties, translated and introduced by Isabelle Rabut and Angel Pino. Albin Michel, 1996, 360 pages. (4) ” Pékin Shanghai, tradition et modernité dans la littérature chinoise des années trente” under the direction of Isabelle Rabut and Angel Pino. Bleu de Chine 2000, 320 pages. 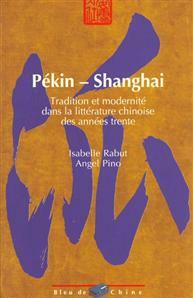 This book contains numerous articles about the quarrel Beijing / Shanghai (Jinpai / Haipai). (5) “Shanghai” published by Nicolas Idier. Robert Laffont, 1470 pages, 2010, 33 euros.